Great and friendly team. Super efficient and easy to work with. We had a full load of rubbish which has been taken away so quickly and for the cheapest price. Thank you. Definitely recommend them. Thankyou Paul and your team for your great service at a very reasonable rate. Happy to recommend this company. Paul’s Rubbish Removal offers complete rubbish removal services for your home or business including residential households, offices, retail locations, building sites, demolition and more. 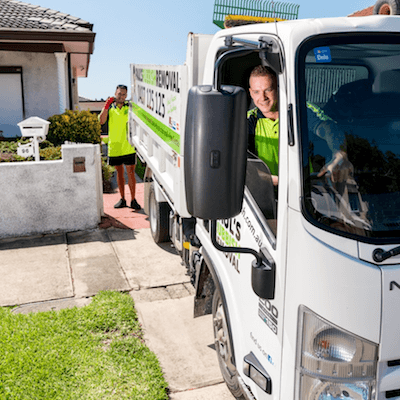 We are a trusted Sydney rubbish removal company that handles the most demanding work – and we ensure that your rubbish is always recycled, or removed responsibly. Our team of professional and friendly rubbish removalists in Sydney take tremendous pride in their work. We’re a local company who understands what the Sydney locals want. From small rubbish collection jobs to complete property clean-ups and junk removal, we will get the job done. 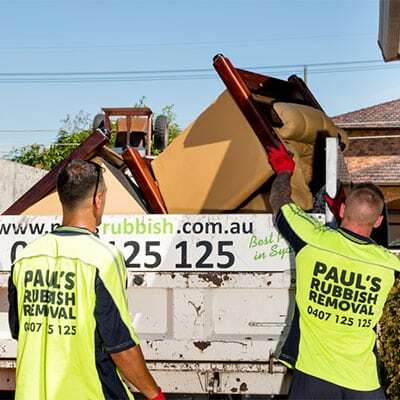 If you have old furniture, broken or unwanted white goods, appliances, electronics, building site debris, green waste or any other type of rubbish, Paul’s Rubbish Removal is your company for a fast and hassle-free rubbish removal and clean up service in Sydney. We also provide same-day rubbish removals all across Sydney’s metro! Need fast and reliable rubbish removal? We help families, businesses and trademens safely remove and dispose of rubbish and waste all over Sydney. Call Paul for a free quote today 0407 125 125! We help families, businesses and tradesmen safely remove and dispose of rubbish and waste all over Sydney. Paul’s Rubbish offers some of the best rubbish removal prices in Sydney.  We always encourage recycling best practices at all times and always recycle junk and waste where appropriate. We provide an unmatched, friendly and affordable, same-day rubbish clean-out to all suburbs in Sydney. Our team of experience and on-time rubbish removalists can remove or dispose of household rubbish, garden rubbish, white goods and unwanted household furniture rubbish, bricks, cardboard, concrete, soil and timber rubbish. We also offer affordable removal pricing to builders dealing with speciality items such as strip outs, labour hire, demolition, removal of building site rubbish and waste. We remove rubbish, junk and waste from every suburb of across Sydney’s metropolitan area. There is no job to big or small for our team. Paul’s Rubbish are a friendly and out-going bunch who are always looking to get the job done. We always clean up after ourselves and ensure we leave your site with happy faces all around. Our team will not leave until you are 110% satisfied with the job. Paul’s Rubbish Removal services the entire Sydney region. 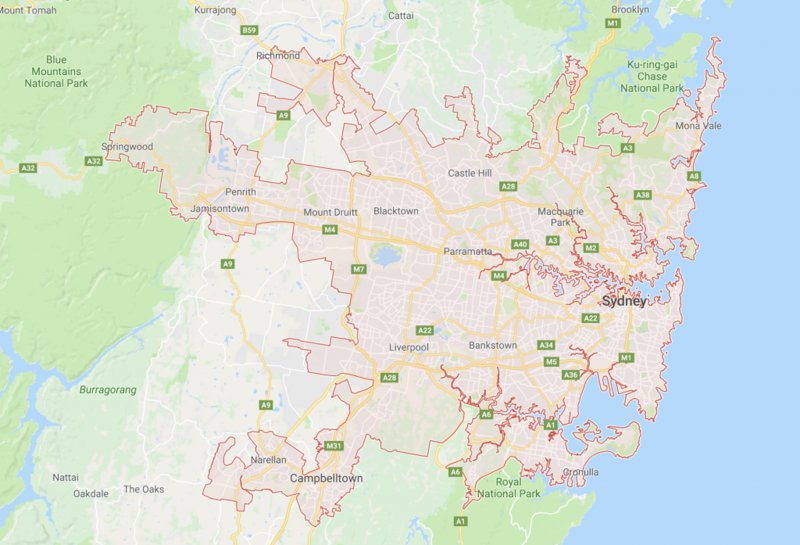 Our serviced areas include the Inner West, Eastern Suburbs, North West, The Sutherland Shire, North Sydney, Western Sydney, South West Sydney and Greater Western Sydney. Sydney is the capital city of New South Wales and is a culturally diverse city with ethnicity from all around the world. It is the most populated city in Australia with an estimated population of over 5 million residents. The Sydney metropolitan area has more than 650 suburbs in a 50km radius. Sydney is most renowned for its famous landmarks the Sydney Harbour Bridge and Sydney Opera House. However, there are many things to see and do in Sydney. Being well-known as a country with scorching heat in the summer, Sydney’s beaches are easily the popular destination of choice for tourists and residents. If you are located near the beach in the Eastern Suburbs, chances are, you probably don’t have time to clear out your rubbish. Why waste your weekend on clearing out your junk when you could easily get Paul’s Rubbish Removal team to do it for you at the LOWEST prices in Sydney. While you are out surfing the waves at Bondi Beach, Maroubra Beach, Manly Beach, Clovelly Beach, Coogee Beach or Malabar Beach, we are busy clearing out your garbage onto our trucks. If you are located in the Inner West, enjoy the day with your local cafe and embrace the amazing Sydney coffee atmosphere. Don’t spend it breaking your back and sweating over old junk that needs to be removed. Let us handle it for you while you head out to Newtown, Surry Hills, Alexandria or St Peters and have a cup of coffee with your friends. There is nobody that we know in North West Sydney that enjoys lifting heavy junk for removal. Get us to do it instead! You could take the family out for an adventure with a Greater Blue Mountains drive or to the Castle Towers in Castle Hill for a little bit of shopping. North West Sydney is beginning to emerge with major property developments. On the other hand, if you are a resident of South West Sydney, we know that you would prefer to do some shopping in Liverpool Westfields or visit the suburb that is known for its South-East Asian Cuisine; Cabramatta. Nobody has time to transport back and forth from the landfill to dump their junk, let alone sorting through items that can be recycled. Arrange a schedule with us and then head off to the famous Taronga Zoo or Luna Park in North Sydney. While you are away, we’ll get rid of any junk that you need to be removed. Better yet, we’ll even clean up after ourselves to make sure that the place looks spotless. If you are more of an adventurer, you could do some kayaking and sailing on the Hawkesbury River. BEST PRICES IN SYDNEY – Grab a free quote with Paul’s Rubbish in Sydney today by calling 0407 125 125. We encourage you to show your support to these great initiatives that focus on recycling, sustainability and welfare.